Does Your Patient Need a Pain-Free Alternative to Traditional Fillings? Silver Diamine Fluoride (SDF) has only recently become popular among the dental world in the US; however, it has been widely accepted and used for decades in other countries. An exciting option for treating caries in all patients, it is especially helpful for use in bedbound dentistry New York City dentists are offering. Elderly patients often forego any cavity treatment at all, simply because the only option they know involves a drill and much discomfort. With this new method for treating dental caries in bedbound elderly, geriatric dentists are experiencing exciting success. But simply stating there is a new, exciting method may not be enough for you. That’s why we seek to give you more information. Silver diamine fluoride is an antimicrobial liquid that is brushed onto the teeth. 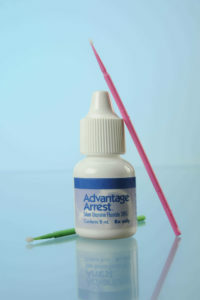 It comes as a clear odorless liquid, currently available in the US under the name Advantage Arrest. The antimicrobial properties of this liquid work to actually kill the bacteria in the tooth that is causing the decay. Yet, it doesn’t just stop at the affected tooth; silver diamine fluoride is effective in also killing other bacteria in surrounding areas. Silver diamine fluoride should work on most areas of decay, dependant upon how deep or severe the area is in regards to decay. What are the benefits of using silver diamine fluoride on bedbound patients? Bedbound dentistry New York City professionals provide brings many challenges. Often, elderly patients simply do not want to go through the pain and discomfort of receiving the traditional drill-and-fill method of cavity treatment. They figure with their age, saving the tooth simply is not worth the trouble. But providing a pain-free alternative to drilling and filling a dental cary greatly increases the percentage of bedbound patients that are willing to receive treatment. Elderly patients love this pain-free alternative. How much does silver diamine fluoride cost? Another tremendous benefit, silver diamine fluoride actually cost less for housecall dentists in New York City to provide to their patients. Because it involves less time and no expensive equipment, this drill-free alternative is not just better for the pain threshold; it’s also better on the wallet. If you have a loved one that has been reluctant to seek treatment for dental caries, consider offering this pain-free, low-cost alternative. Geriatric House Call Dentistry in New York City offers silver diamine fluoride for their elderly and/or bedbound patients. Call today to learn more about Dr. Alisa Kauffman at Geriatric House Call Dentistry. If I have dentures I never have to go to the dentist again, right? NO! Have you lost most or all of your teeth but are afraid of getting dentures? Don’t be, the geriatric denture dentist in Manhattan wants to dispel some myths about dentures. Everyone will know I’m wearing dentures. False! Today’s dentures look quite natural and if your dentures fit well and you take proper care of them, no one will notice that you are wearing them. It’s important to see the Manhattan geriatric denture dentist if you notice clicking or slipping, because poor fitting dentures are not only uncomfortable but may cause dental damage. Once you get dentures, you’ll never have to go to the dentist again. Wrong again! Remember that during a dental visit, your dentist is not only checking your teeth but giving you a complete oral exam which includes checking your gums, tongue and the inside of your mouth. It’s difficult to eat when wearing dentures. It may take a little practice, but once your mouth has adjusted to the dentures you can eat comfortably. Dentures will last a lifetime. That would be nice, but it’s just not true. Dentures are made of acrylic and are susceptible to chipping or breaking if they aren’t properly cared for. It’s important to visit your dentist regularly and make an appointment with the NYC geriatric denture dentist if the dentures are damaged or don’t fit properly. Rinse the dentures before brushing to loosen any food and debris. Use a brush made specifically to clean dentures and warm water to gently clean dentures without scratching them and once a week soak them in warm water with a denture cleaning tablet for 10-15 minutes. When you’re not wearing your dentures, keep them covered in a water in a safe place so they don’t warp. 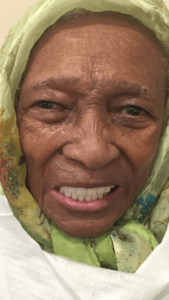 If you need partial or complete dentures but have limited mobility, don’t fret, Dr. Kauffman, the geriatric denture dentist in Manhattan makes house calls! Dentures can be made in the comfort of your apartment, as well as adjustments. Dr. Kauffman is a top 25 dentist who is dedicated to providing quality dental care to senior citizens with limited mobility, and multiple health conditions. Learn more about the geriatric denture dentist in Manhattan or to schedule an appointment today, please call 917-826-6278.